Even Creeper’s gargoyle is making fun of Batman’s gargoyle and that hideous nose ring. Hellgrammite is a bug enthusiast who turned himself into an insect person after being bullied as a child. Someone helps him escape prison during a press conference attended by Jack Ryder and his biggest rival, shock journalist Dan Drew, who has pledged to unmask Batman. 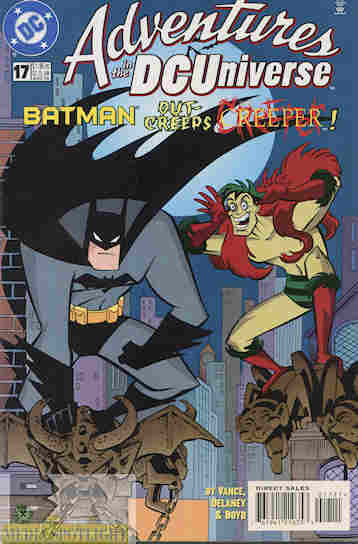 However, Jack is also the nutball superhero the Creeper, and he ends up teaming with Batman to bring Hellgrammite back in. Hellgrammite betrays his rescuer, who turns out later to be Drew, hoping to use the villain to unmask Batman, and Drew is later exposed on TV by Jack after the Creeper and Batman defeat Hellgrammite. What they got right: In Brave And The Bold #80, Hellgrammite made his debut, fighting the team-up of Batman and the Creeper, so it’s a nod to that story. Batman and Creeper make for a fun team-up, since Creeper is basically the Joker as a superhero (his origins are even tied to the Joker). What they got wrong: At least that’s his origin in The New Batman/Superman Adventures. In the regular DC Universe, which this is supposed to be tied to (but as I’ve noted many times the writer didn’t seem to know what universe they were writing in the Adventures titles), his origin involves a scientist with either a serum or technology, with no ties to the Joker. Then for some unknown reason they tied him to a demonic origin, which should be the origin of Jason Blood and Etrigan the demon, so I don’t know what they were thinking. He’s a Japanese oni that uses Jack Ryder as a host in The New 52. What was wrong with his original origin? My point is Creeper has the wrong origin here and he’s had too many as it is. This should have been a story in Batman: Gotham Adventures, not a story set in the regular DCU. Recommendation: A fun adventure and I do like this incarnation of The Creeper. He’s just in the wrong comic. Worth a look though. Posted by ShadowWing Tronix on October 21, 2017 in DC Spotlight, Yesterday's Comics and tagged Batman, DC Comics, DC Universe, Hellgrammite, The Creeper.